Here he is, the next Chicharito Hernandez. Cruz Azul's Javier Orozco is only 22 years old and was already the all-time leading goal scorer in CONCACAF Champions League play with 20 goals before his 3 goal outburst last night (video highlights below). 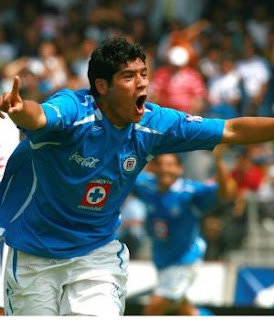 The three goals give Orozco 23 career Champions League goals in only 20 matches. This includes 10 goals in 4 CONCACAF Champions League matches this season. The last young forward named Javier who scored goals like this? A certain Javier Hernandez who you may have heard of. Chicharito Hernandez made his debut with Mexico's senior national team in 2009 at the age of 21 and has scored 10 goals in 19 appearances so far. Javier Orozco made his debut a few weeks ago with Mexico's senior national team at the age of 22, but is still looking for his first international goal after two appearances. Will he score at a similar pace?